Malta is a small country in the Mediterranean, often thought of as an island, but in reality an archipelago with three main, inhabited islands and numerous smaller, uninhabited oness. It is one of the smallest countries of the world, with about 450,000 inhabitants, most of them of Maltese ethnicity who speak Maltese, though English is also an official language. Because of its location it has been ruled by many other nations, most recently United Kingdom, until it gained independence in 1964. Malta is a popular tourist destination which has nine UNESCO world heritage sites, including the thousands of years old Megalithic temples. Many people go there just to enjoy the beaches (and the over 3,000 hours of sunshine per year), or on English language courses. There is some health tourism, too. The Maltan cuisine has been influenced by many other cuisines, e.g. English, French, Spanish, Italian (especially Sicilian), Greek and Maghrebin (North African). Rabbit and pork are the most popular meats. Not surprisingly seafood is also eaten a lot, as are eggs and cheese. Several vegan dishes exist too, often either stuffed vegetables, pies or pastries or something based on broad beans (favas). But be careful – that pumpkin pie may contain anchovy! Many pasta dishes are popular, including ravioli, pasta soups and casseroles, though rice and potatoes are also common. Food is often flavored with garlic and fresh herbs. There are many cakes and pastries, which can be flavored with a wide variety of ingredients: dried fruit, sweet or bitter almonds, chestnut, mastic, honey, rosewater, orange blossom water, cocoa, carob, treacle, citrus zest, sesame seed, cinnamon, cloves and aniseed. They are mostly associated with festive occasions. 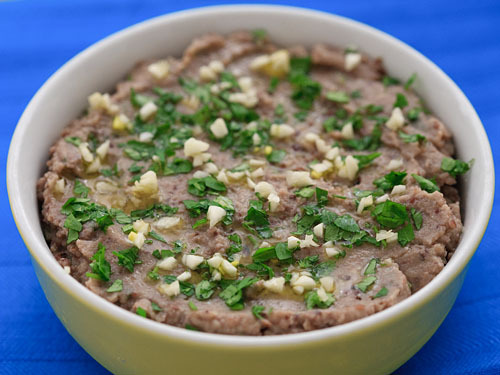 Bigilla is a popular bean dip, very simple and intrinsically vegan. I don’t really like broad beans that much (outside of falafel), but I wanted to see if this dish could change my mind (usually it is apparently made with a specific type of broad beans, but I couldn’t find those). Well… It’s not bad, but I’ve had better bean dips. But if you’re a fava fan, this one could be for you. Soak the beans for 6-12 hours. Boil until soft (30 minutes in a pressure cooker, an hour or more otherwise). Drain but reserve some of the cooking water. While still warm, blend all the ingredients together until smooth. Add cooking water as needed. It should be quite liquid, as it will firm up considerably as it cools. Let cool in the fridge. Serve topped with finely chopped garlic and parsley and drizzled with olive oil. This makes a lot of dip, so unless you’re making this for a party or a big, hungry family, you may want to halve the recipe. This entry was written on July 29th, 2012 by Maija Haavisto and filed under Dips, sauces and condiments, Europe.